Hardware backup solutions are very popular among people who don’t want to bother about online backup. There are special USB backup devices which require you to only press one button to automatically copy all your HDD contents to a built-in HDD. The price of convenience of these devices is that they don’t provide enough flexibility for many use cases. Backup strategy is always about finding right balance between speed and reliability. Want to keep data locally? Use backup hardware, but don‘t expect it to save you from fires, floods, theft, etc. Thinking about online backups? Then prepare yourself to rely on Internet connection and relatively poor speed of recovery. The good news is that there are solutions on the market that can provide a needed level of flexibility. Our software is designed for Windows 10/8/7/Vista/XP and 2016/2012/2008/2003 Server and allows backing up to any local and networked locations including NAS, USB, FTP/SFTP/FTPS, WebDAV, Amazon S3, and much more. There is no strict rule requiring you to choose between hardware-based approach and online backups. In fact, you can combine them: the most recent trend in backup practices is a so-called D2D2C, or Disk-to-Disk-to-Cloud. It expects that you copy backups on a local hard drive, and then make use of Cloud replication. Local and External HDD. FireWire, USB devices are among the most popular hardware backup solutions for their reliability and large capacity. With our program you can back up to any drive recognizable by Windows. Online Backup. We have a proprietary Remote Backup Service that lets you store data on our secured servers located in California. LAN and NAS Backup. You can back up your data over your network, using any network drive accessible through your operating system. FTP, SFTP, FTPS, WebDAV. Your data can be stored on any remote server of your choice. We welcome you to check out Standard edition of our software. It has all the basic features, and you can try it free of charge for 30 days! 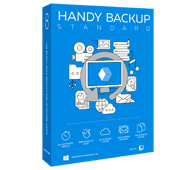 If you’re still not sure if the product is right for you, please see a full list of backup features. In it, you can find more information about supported hardware and online locations. Windows 8 Backup - back up the most advanced OS of the day! MySQL Backup - in addition to files- and image-based backup, you can also protect your databases!